PRESS RELEASE – San Clemente, CA (October 15, 2018) – Bemus Landscape, a full service commercial landscape provider, announced today that it has been selected by Paradise Point Resort & Spa to perform the grounds management for the resort. “Bemus Landscape serviced the property in the past, and we are very excited for the opportunity to partner with Paradise Point Resort & Spa once again. This site is one of the most unique properties in Southern California and we are proud to have it back in the Bemus family.” said Spencer Bemus, Vice President of Tree Care. Paradise Point Resort & Spa offers a unique island experience, right in the heart of San Diego. The motto “just another day in Paradise” rings true when one experiences the 44 acres of landscape and property that this resort has to offer. The resort is located on an island in Mission Bay, just over the bridge from Sea World. It opened in 1963 under the name Vacation Village and in 1998 was renamed Paradise Point Resort & Spa. Over the course of 55 years, the landscape has matured to a one of kind experience in Southern California. 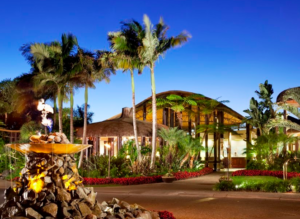 The property boasts over 2,000 palm trees (30+ species) that gives it a Pacific Island feel with a San Diego twist. There are also several hundred species of trees and shrubs throughout the property. 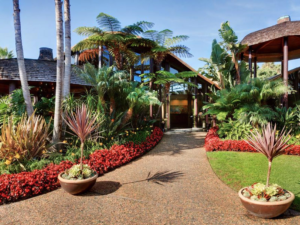 A few of the many property highlights are the Bromeliads located in front of the main pool, Cycads and 30’ tree ferns in front of the lobby, an 18 hole live turf miniature golf course, indigenous Torrey Pines near the bayfront all interlaced with numerous other trees, palms and shrubs. Over the years the property has hosted notable landscape industry events for ISA (International Society of Arboriculture) and BSI (Bromeliad Society International). If visiting the property we recommend taking a tour that starts at the lobby and ends at the barefoot bar grill. Where you go in between, is completely up to you. We only hope that one pauses for a moment, to appreciate all that the resort has to offer. Bemus Landscape is a family owned and operated commercial landscape company that has been in business since 1973. Our purpose is “Serving Clients, Growing People” and we pride ourselves on our unique approach to landscape maintenance. We have been successful over the last 45 years by establishing long term relationships and partnerships with our employees and clients based on trust. We focus on things such as enhanced training, well paid employees, and cutting edge landscape technology that are all related to higher productivity and increased quality at a lower cost.